In 1974, the Society prepared a paper outlining a new perspective on business management derived from the teachings of Sri Aurobindo and The Mother and tested on the Society’s agricultural project and in a US corporation. Copies of the paper were submitted to more than 90 management institutes around the world and two articles were published by management journals in India. In 1975, the new approach was applied to analyze management problems at Neyveli Lignite Corporation, when the Superintendent of the Thermal Power Station requested assistance. The Society’s recommendations were implemented and the problems were resolved. In 1982, a study was undertaken of management problems at E.I.D. Parry & Co’s sugar factory at Nellikuppam. The study focused on the need to improve the rapport between the factory and the cane growers and between management and labour. In 1987, the Society undertook management studies of Bajaj Auto Ltd. in Pune, one of India’s fastest growing and most profitable manufacturing corporations, and First Leasing Company of India Ltd., the first industrial leasing corporation in the country and one of India’s fastest growing and most profitable service corporations, in order to identify the factors responsible for their rapid growth and to recommend solutions to problems incurred during external expansion. This study concluded that the factors responsible for stimulating and retarding the growth of service companies and manufacturing companies are quite similar and that Indian corporations face growth problems similar to those encountered by companies in the USA and Europe. Specific recommendations were prepared for improving productivity, profitability and organisational efficiency in both companies. When Chrysler Motors, USA was on the verge of bankruptcy in 1979, the Society conducted a study to assess the root causes of the company’s crisis and the chances of its survival. Contrary to the view of most management experts, the Society concluded that Chrysler could survive the present crisis and emerge stronger than ever before. A report analyzing Chrysler’s problems and a list of recommendations were submitted to the Chairman of Chrysler Corporation, Lee Iacocca. In 1983, the Society was invited to study the management problems of Rhone Poulenc Nederlands b.v., the $80 million Dutch subsidiary of a multi-national French Chemical and Pharmaceutical company. Researchers interviewed 33 staff members of the company and undertook a detailed examination of organizational functioning, market trends, growth potentials, marketing techniques and operating systems. Recommendations were made for improving performance at the institutional, organizational and operational levels. During 1984, a study of highly successful American companies was conducted in collaboration with Frederick Harmon, Vice-President of American Management Association in New York. The aim of the study was to test the validity of the Society’s theory describing the process of corporate development. The study involved on-sight interviews with over 100 employees of major American companies including Apple Computers, AT & T, Coca Cola, Delta Airlines, Dupont, General Mills, IBM, Marriott Hotels, Merck Pharmaceuticals, Northwestern Mutual Life Insurance and Sears Roebuck. The principles and process developed by the Society and the findings of the study were published in the US as a book entitled The Vital Difference: Unleashing the Powers of Sustained Corporate Success, authored by Fred Harmon and MSS staff Garry Jacobs. The book was commended by leading management experts like Dr. Peter Drucker, Dr. Tom Peters, and Dr. L.K. Jha. 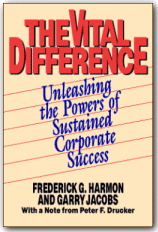 The Vital Difference - Unleashing the Powers of Sustained Corporate Success by Fred Harmon and Garry Jacobs, Amacom Publications, NY, 1985. There is an inexhaustible potential within the organization. It is inexhaustible because the more it is drawn from, the greater it grows. The more enthusiastically it is tapped, the more it increases at its source. The more it is enjoyed, the more it expands. Those who have used this potential to unleash the powers of sustained corporate success have learned how to make a vital difference, in their lives and in the lives of their organizations. The first qualification is to want it. The more you want it, the more you grow. The more conscious you become of it, the more it beckons you to further growth. That is the essential message of this book. For those who seek the ultimate boon of endless corporate expansion, the authors invite you to that great adventure and to share their glimpse of a vision of the process. For those who seek a more limited boon like doubling your profits or sales, the book presents specific strategies for achieving your goal. A series of 8 one-day and 3 two-day seminars were organized in the USA, Canada and Europe by the American Management Association to present these ideas to top executives of major Western corporations. Articles written by the Society were published by three management journals in the USA -- Management Review (Nov. 85), Supervisory Management (Nov. 85) and The President’s Newsletter (Sept. 85). The results of the European study were published by Management Centre Europe. Articles prepared by the Society were also published by several European management journals - the International Management Development Review (Jan. ‘86), Profile (June ’86), Chief Executive (June ’86), European Management Review (summer ’86), and International Management (June ’86). Subsequently, a similar survey of 770 US corporations was conducted in association with the President’s Association, a division of American Management Association. This is a book about the process of corporate growth-what makes it happen, what makes it stop, and how it can be accelerated in any company to dramatically increase revenues and profits within a very short period of time. 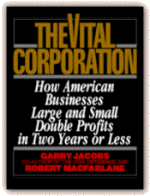 The Vital Corporation illustrates this process with inspiring examples of companies of all sizes drawn from a wide range of industries, which have utilized the process to double or even triple their profits. The Vital Corporation also contains specific strategies for applying these principles, plus a series of detailed exercises to assist you in making the ideas in this book as real and as relevant as possible. From 1996 to 1998, the Society conducted a series of in-depth studies of the retail electronics industry in the USA to identify the technological, organizational, distribution, management and financial factors that influence development of the market segment. These studies were undertaken in collaboration with the Professional Audio Video Retailers Association of North America (PARA). The findings were presented by Society staff at two annual conferences of association members in April 1997 and April 1998. The society has also worked closely with the association to identify strategies to accelerate the growth of the entire industry through closer collaboration between association members. Additional studies and conferences were organized from 1999 to 2003. Over the past decade, the Society has conducted extensive studies on the process of corporate growth. These studies document that there is a close parallel between the process of social development and the process of corporate development. In fact, the process in both cases is the same. In recent years, the Society has been conducting field tests of its theoretical concepts to determine whether the theory can be practically applied to improve the performance of businesses in different industries, both within India and overseas. In 2003-04, staff of the Society developed a detailed manual for application of management principles in this industry and to present its approach at a national conference of the association in March 2004. The Society completed its two year study of the Tool & Die Industry in the USA and presented its findings at two five-day conferences organized by the National Tooling and Machining Association in January 1988 and January 1989. The study involved in-depth interviews with 30 companies in the industry and identified opportunities and strategies for the growth and improved profitability of companies in this industry. Rapid developments in manufacturing technology, the globalization of markets, downsizing and consolidation by major corporations and increasing demands for quality have a profound impact on basic manufacturing companies in the USA and internationally. In 1998, the Society conducted a study in collaboration with the National Tooling and Machining Association, an association with 2400 member companies, to identify the factors shaping the development of this industry and to identify strategies that will enable progressive companies to respond effectively to the challenges that the rapid change is posing to business. The study, which included interviews with over 40 member companies of the Association, involved a detailed analysis of economic and commercial trends at the international, national and industry level. The results of the study were published by the Association and presented at a national conference in San Diego in January 1999. In 2000-01, the Society conducted a study of the impact of globalization on the special machining industry. In May 2001, a conference was conducted by Society staff for about two hundred member companies of the International Special Machining & Tooling Association in Chicago. The Society was requested to conduct further research work for NTMA in 2004-05 on strategies for leadership in manufacturing in the emerging global marketplace. The findings of this study were presented at two three-day national conferences in St. Petersburg, Florida and Couer de Alene, Idaho in February and September 2005 on the theme of leadership in manufacturing. The first seminar examined the impact of global trends in areas such as marketing, technology, organization of production and sourcing, trade and labor and projected their future impact on this industry. The second seminar focused on personal leadership strategies for sustained growth in a rapidly globalizing market. In 1996, the Society participated in discussions with Frederick G. Harmon which led to the publication of Playing for Keeps: How the World’s Most Aggressive and Admired Companies use Core Values to manage, Energise and Organize their People, and Promote, Advance and Achieve their Corporate Missions. The book presents a step-by-step analysis of the process of value implementation by leading American corporations. In 2000, the Society undertook a study of international trends in the newspaper industry in India and around the world. Emphasis was placed on the role of newspapers in reporting changes in Indian society and how they could become effective instruments to accelerate social development by reporting changes in social activities, attitudes and values. The findings of the study were presented and discussed with senior editors from the New Indian Express, one of South India’s leading newspaper companies. From 1996 to 2000, Society researchers conducted a series of four studies in collaboration with Minnesota Technology Inc., a government development agency in Minnesota, USA responsible for stimulating the development of manufacturing companies in the state. The studies examined the development and functioning of three rural-based manufacturing companies in the electronics, textiles and boating industries. Further studies are now being conducted in several companies in South India. Staff of the Society have continued to test its theoretical approach to business development. A project was undertaken from 2000 to 2005 to apply and test these principles to improve the organizational functioning and financial performance of The New Indian Express Group, publisher of leading newspapers in the five southern states of India. Three Society staff were engaged in this project. In 2000, the Society conducted extensive research on emerging trends in different sectors of the US and global economy for a study conducted by Frederick G. Harmon on behalf of the Kipplinger Organization, USA. The findings of the study were published as a book in the USA entitled Business 2010. The Society studied the role of values and methods of value implementation in the growth and success of businesses with a study of values in an entrepreneurial Dutch company. The study found that values such as quality, customer service, integrity and commitment to its people played a crucial role in generating a competitive advantage for the firm leading to its rapid expansion. Based on this study, the project leader, Robert van Harten, was awarded an MBA degree by a Dutch University. In 2004, the Society conducted a 12 week training programme in Chennai for graduates on the theory and practice of management consulting in collaboration with Career Development Foundation of India, associate partners of Cambridge University International, UK. In September 2006, a Society staff member was deputed to conduct interviews with the staff of Sisvel Audiompeg, a fast growing Italian-American company involved in enforcing patent rights on mpeg audio technologies. We conducted a two day seminar for senior staff of the company in Berlin to present strategies to cope with the company’s very rapid growth in revenues over the past few years. In 2007, the Society commenced a new research project with a Chennai-based event management company, Aura. The objective of the project was to apply the Society’s theory of business management to identify strategies to accelerate growth and profitability of the company. The Society presented a two day training program to Aura staff. For the past three decades, the Society has been working to evolve a new theory of business management based on the process of creation described by Sri Aurobindo. The findings of this research have already been published as five management books and number articles in the USA. Over the past three years, the Society has continued its original research on this project and generated a number of articles, working papers and detailed research notes. Good to Great by American business expert Jim Collins has become a leading international best-seller, seeks to identify the essential characteristics of major corporations that consistently outperform their competitors over long periods of time. In 2006, the Society undertook a comparative study and analysis of the factors identified by the Collins team and assessed their findings in the light of its own theoretical approach to sustained business success. The increasing frequency of mergers and acquisitions in international business today has focused attention on the challenge of how to combine and integrate previously independent companies in such a manner as to achieve maximum efficiency and financial performance. In April 2006, the Society began a study of the concept and practice of integration in business based on its earlier theoretical work. The Society’s theoretical approach is to view a company as a living organism and to compare integration of a business with the complex integration achieved by the human body in interlinking all its biological functions, systems and organs. While complete integration in a social organization appears unattainable, the scope for increasing the level of integration is enormous. Each of the five components of a company – market, technology, people, finance and organization – can be further subdivided into 20 subcomponents and each of these 100 subcomponents can be fine-tuned to harmonize its operations with that of all the others.